When you’re tired or just don’t have that much time to cook, breakfast for dinner comes together so easily. Breakfast for dinner just feels more casual. Like you should be eating it on the couch with your pajamas on, probably curled up with a loved one and a blanket. On the nights that I go to run club and J is busy, we’ll often have this for dinner. I come in the door and cut up the potatoes, drizzle on some olive oil and Lawry’s seasoning salt, and toss them in the oven at 400 degrees. By the time I’ve showered they’re nearly done. The potatoes finish roasting while I scramble up the eggs with just a little bit of milk and some goat cheese melted in. 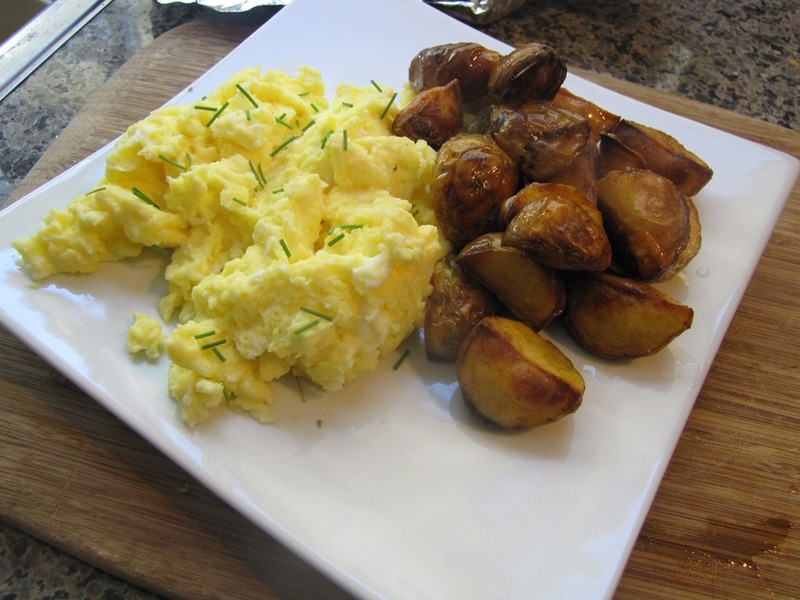 This is proper comfort food, soft curds of egg with just a tangy hint of goat cheese and salty, crisp potatoes with creamy centers. I was feeling fancy, so I added some chives from our little back patio herb garden. J adulterated his version with liters of hot sauce, of course. And we ate it in our pajamas, on the couch, watching old episodes of favorite TV shows. Do you like breakfast for dinner? 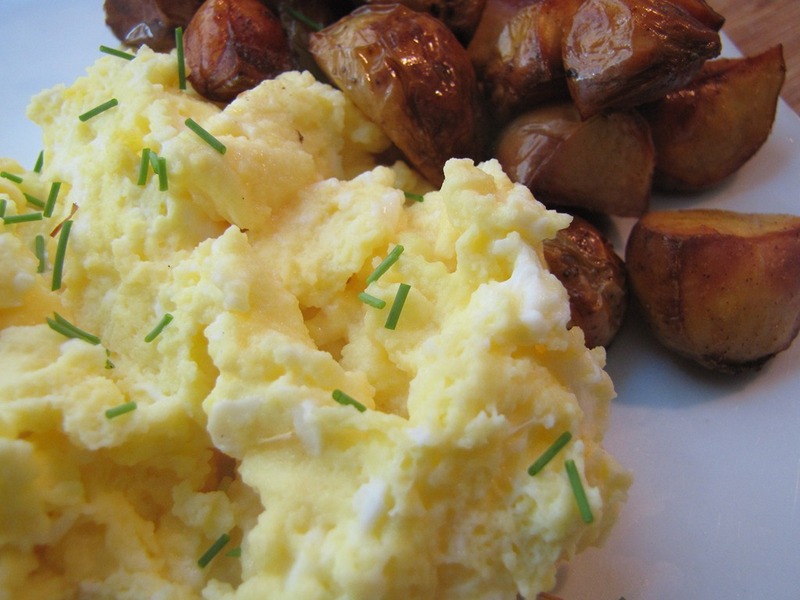 This entry was posted in Uncategorized and tagged breakfast, Comfort food, vegetarian. Bookmark the permalink. The addition of hot sauce is just like every single meal with my husband. I love breakfast for dinner sometimes. It feels even cozier to eat those foods at night than it does in the morning! This is comfort food for me too, although, the cheese wasn’t goat, but should have been. I love potatoes anything! This is a great idea. I like to put hot salsa on my eggs. It’s tasty.